Simple website builder now offers private label CMS for creating and managing multiple websites. 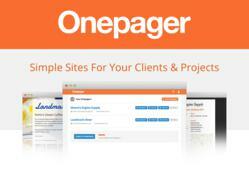 Onepager, a startup offering a simple website builder, announces the release of its new Agency Plan, which allows customers to manage multiple sites and users under a single account. The new features under the plan enable third-party content creators, such as agencies and freelancers, to focus on content and design without worrying about the technicalities of coding or more complex CMSs such as Wordpress. At larger companies, employees can instantly build webpages for in-house projects, no matter their web design skill level. And the new Private Labeling option allows for custom admin pages that make clients’ experiences seamless and brand-specific. The added support for multiple users and sites allows freelancers and agencies to enjoy the benefits that Onepager has offered small businesses since its beginning. Onepager’s intuitive and affordable approach to site-building has helped small businesses all over the world—whether it’s a restaurant, yoga studio, news provider, or even a pocket square designer—to create self-made, professional-looking websites. And with built-in mobile readiness and customizable features, Onepager combines design with robust functionality in a simple, one-stop process. When companies face limited resources and an increasing need to stand out, Onepager helps them make their mark online while saving time and money. Whether you’re making a site for your business or making sites is your business, Onepager’s platform provides an easy, quick way to create and manage beautiful, tailor-made webpages, giving you more time to focus on your business. To start building, visit onepagerapp.com.